Mrs. Tran Thi Lan Hinh, spouse of the ambassador of Viet Nam in Seoul, recently introduced some of the traditional Vietnamese food and beverage at a Vietnamese restaurant in Seoul. The Vietnamese cuisine is becoming increasingly popular in Korea among the Korean people regardless of difference in age but more among the young people. At Viet Quan, the restaurant in point, some editors and reporters of The Korea Post media was given the rare opportunity to sample, more correctly enjoy, some of the tasty food and beverage of Viet Nam. At Viet Quan, nestled in between Gyeong-bok Palace and Chang-deok Palace, the visitors tasted two kinds of rolls, fresh roll and spring roll, which were included in the meal. Madam Tran explained that fresh rolls contained fresh ingredients while spring rolls were deep-fried. Rice noodles were also served during lunch and Madam Tran explained that because Vietnam is a country in which rice is mainly produced rather than wheat, rice is a primary ingredient of many of Vietnam’s products like noodles and wraps. Another highlight during the meal was pho, the ever popular Vietnamese dish of rice noodle served in hot meat broth soup. Bean sprouts were served on the side to be eaten with pho, and Madam Tran cautioned not to put in too much bean sprout into pho as it will dilute the taste. It was interesting to note that perhaps to cater to Korean customers, kimchi and pickled radish were served as side dishes, despite them being non-Vietnamese dishes. The meal was concluded with iced Vietnamese coffee. The owner of the restaurant is Vietnamese and has lived in Seoul for more than 25 years, and could speak both Vietnamese and Korean. The employees of the restaurant could also speak both Vietnamese and Korean, making it easy for local people to also come and enjoy authentic Vietnamese food without the worry of language barrier. The interior of the restaurant was also decorated with Vietnamese artworks, giving it a feeling of as if one had stepped into an actual restaurant in Viet Nam. 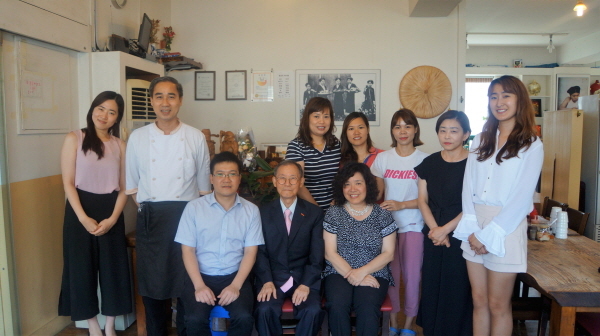 Madam Tran Thi Lan Hinh (spouse of the ambassador of Viet Nam), seated at right, front row, poses with Publisher-Chairman Lee Kyung-sik of The Korea Post (on her left), First Secretary Cao Minh Duc of the Embassy of Viet Nam in Seoul (seated at left), and the proprietress of the Vietnamese restaurant, Viet Quan, in Seoul (standing third from left). Also joining the photo are the editorial-reportorial members of The Korea Post (Sua Kim at far left), Managing Editor Kim Jung-mi (second from right) and Reporter Hillary Kang (standing at right).